Every winter, the St. Herman’s Orthodox Youth Conferences are held on the America’s East and West Coasts. There, for their fortification in the faith and the salvation of their souls, pastors of the Church gather members of the younger generation. This year, the “western” conference was held in Sunnyvale, CA. Over fifty college and high school students were in attendance. All were united by their shared faith, Church, and desire to learn something new. But this gathering also answers one of the most burning questions of youth: where and how to find upstanding peers. Many young people find friends here – those who are older find their sweethearts. “Walk not in the counsel of the wicked,” wrote King David, and for Orthodox youth this conference is a deserving worthy alterative to secular get-togethers. What differentiated this conference from those of previous years was the increased number of tours and trips. 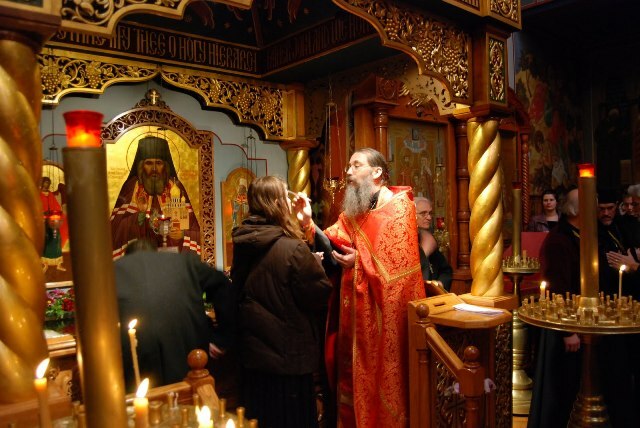 They added a certain variety, and allowed conference participants to visit many Orthodox churches. The conference began in the second half of the day on Saturday, with the youth participating in the evening service at St. Herman of Alaska Church. The second day was also spent in its entirely in Sunnyvale. The third day was spent in the “Golden City,” San Francisco. The morning began with the Liturgy in the Cathedral of Our Lady, “Joy of All Who Sorrow.” The pilgrimage continued at St. Tikhon of Zadonsk Church, followed by a visit to the old cathedral. In each church, conference participants were told about the history of the church and the events there relating to the life of St. John of Shanghai. The comprehensive and informative tour was thus entitled “In the footsteps of St. John of Shanghai.” We spent the evening in a wonderful park overlooking the ocean, taking in the marvelous sunset. The day’s final stop was the Church of All Russian Saints in Burlingame. This parish is renowned for its remarkable cooking, and after a delicious dinner, everyone agreed that the reputation was deserved. On the fourth day, conference participants were taken to Monterey. Even though the trip was long, the day turned out to be full of fun activities. First, the Monterey Bay Aquarium, after which we visited St. Seraphim of Sarov Church, where there was a presentation and open discussion, followed by volleyball on the shore, a hike to dinner at a restaurant, and a nighttime bonfire on the beach. This year, in addition to learning many new things, we were also able to see a great deal. All those in attendance will long cherish these memories. In addition to the fairly packed schedule, the youth unexpectedly organized an event for themselves. It only took a few enthusiasts to hold “lessons” on national and group dances two nights in a row in the hotel’s main hall. For many, these lessons hit home: the hall was constantly filled with laughter, and smiles shone on the dancers’ faces. It was suggested that, considering how many people enjoyed them, time be set aside for similar lessons in the future. There was one additional difference: this year’s conference was opened by Archbishop Kyrill of San Francisco & Western America. After His Eminence’s introductory remarks began the presentations: “Ambassadors of our Faith” by Dimitri Jakimowicz, and “What is a Holy life and how is it achieved” by Archimandrite Irenei Steenberg. Fr. Dimitri’s short presentation was about St. Herman of Alaska, told in several stories demonstrating mercy and helping others. Fr. Irenei’s deep and fascinating presentation was dedicated to the topic of holiness: “What is holiness?” and “How do we achieve holiness in this transitory life on earth?”, among others, were issues relating to this topic. On the third day, a presentation was delivered in the old cathedral by Archpriest David Moser of Idaho about “St. John of Shanghai & San Francisco.” Much was said in the presentation about God’s love, about how we Orthodox are called upon to preach our faith, a little about the American and Russian Orthodox Churches and, of course, about St. John of Shanghai himself. 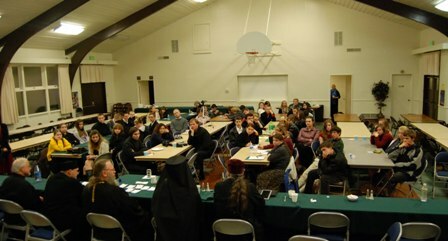 Finally, in St. Seraphim of Sarov Church in Monterey, the conference’s final presentation was delivered on a weighty and difficult topic for our youth: namely, that of Orthodox marriage. Archpriest Alexander Krassovsky delivered the presentation, leading us in discussion and touching on important issues with which every young couple hoping to start a family should be familiar – the spiritual and physical aspects of the relationship, the duties of a wife and husband. In today’s world little attention is paid to issues of family and marriage from an Orthodox perspective, and for that reason these discussions are very important for our youth, especially for those who were fated to lack, for one reason or another, the example of their own parents. Traditionally every conference holds panel discussions, in which members of the clergy will answer any written answers submitted by the youth. Judging by the response received, this is the most salvific part of the conference. After all, it is as these discussions that topics of the utmost importance can be discussed, especially those that trouble the heart (questions can be submitted anonymously). The final quote was definitive of the conference. It is with these words that every presentation by Fr. Irenei begins. One key aspect of St. Herman’s Conferences is the successful combination of the fun and the educational. Presentations are delivered on various topics, sporting events are held every year, time is set aside for discussion and acquaintance and, most importantly, everyone attending the conference is given the opportunity to speak with a member of the clergy. I would like to thank all of the organizers and sponsors for making these conferences possible, for increasing their scope and making them more interesting with every year, and for creating this pleasant, friendly atmosphere that allows even the shiest conference participant to make friends. Thank God that these conferences exist in America, where the younger generation, our future, can gather spiritual strength and arm itself against evil! That God that these events exist, where the wise can impart their experience and knowledge to an attentive and grateful audience! He has faced constant pain, the mob, 21 hour work days. Was it all in vain?